How much flooring do you need to do your wide plank flooring job? To be honest, I use cad and put in the layout…then calculate the area automatically, then add 20 percent. Since you likely don’t have access to that, lets give you the simple way. Calculate each room individually. You only need a square foot count, so say your room is 11′-7 x 12′-5. Round up to the nearest number, say 12 x 13, then add 20 percent. Do a sketch of it, so you can show Merv what the job looks like. He will make sure he mills enough material for you to finish. Do a sketch for each room and allow a 1×6 or 1×8 for thresholds, then add it all up. I always add 20% to the totals so that I can cut a good few inches off each end before putting the flooring down, and I get to be picky. Some people like the big gnarly irregular knots and cracks and curly grains, and others want only the clean grain. Merv likes the irregular grains, I like clean and only small knots. Everyone has different tastes! The ends of the boards often are slightly irregular. Planer snipe (the ends of the boards are often planed smaller than in the middle), and sometimes the end of the board is slightly narrower than the middle. Cut off 6-8″ and the flooring should go down tight. When you cut off the ends, use the fence on the main part of the board so that it is a perfectly square cut. Remember, when you install the floor you need to allow 3/4″ for expansion and contraction around the outside of the room. 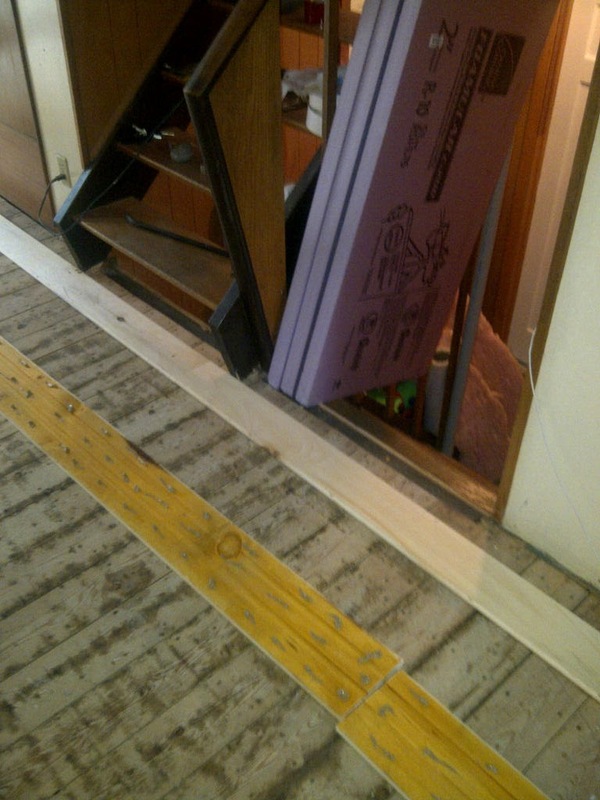 Thresholds (separation pieces under the doorways), don’t need the space. The floor above is one of Merv’s pine floors with a dark stain on it. It was micro-grooved so that they could prefinish the flooring before putting it in place. I dropped by the shop the other day to find Chris and a helper working 2 huge slabs of walnut through the planer. If you have never seen this nutty mahogany colored species, or smelled its acrid semi-sweet aroma during milling, it will stop you in your tracks. You won’t experience it without dropping into Merv’s shop near Collingwood Ontario on just the right day. They routinely prepare these slabs for a local furniture company to make tables. The process involves much more than just slicing up great logs and planing it smooth. Your slab will twist, crack and check and won’t be useful as a table unless it is expertly prepared. Slabs always have to be dried for them to become stable. It can take months to properly dry hardwood in thick sizes, and Merv is picky. He wants the moisture content down to 6%. He attests that is the only way to make a stable piece of lumber that won’t crack or twist. So these slabs have been in the kiln for about 6 weeks, and now they are making them smooth again. Surface inconsistencies become more pronounced during the drying process, some twist, others distort and some parts shrink during drying. Depending on the grain cracks develop–which most people like the look of. If you want to avoid cracks you need to use quarter sawn material, which means you have to start with a very large log. When the bark is left on the lumber we refer to it as “Live Edge”. This option is popular for furniture people. Many use these for mantles and counter tops for a home with lots of wood. If you need this kind of thing, get in touch with Merv. Please give him 2 or 3 months of lead time. Good things take time. He can supply just about any species of lumber. Pine or other softwoods dry faster–but are less durable. As a life long carpenter with nearly 30 years of experience, I can assure you that the vast majority of people that buy flooring, or decide what flooring to use, lack the basic understanding of what they are deciding to buy. They just don’t know the difference between laminate and wood flooring. The trend in new homes and renovations is to use low cost engineered, (pre-finished) flooring. They call it hardwood, because it contains a very thin layer of hardwood on the surface of a plywood/Masonite/adhesive core. They vary greatly in how they are made, the quality of finish and components and for our purpose we will refer to them as Laminates. Engineered flooring is just another name for the same thing. We strip out old style flooring from time to time, but normally the flooring has been in place for a half a century or more, and refinished numerous times. The two floors seen here are brand new wide plank floors. Laminate flooring producers strive to make their floors look like this. Laminate flooring installed will vary between about $5 and $20 per square foot installed. Solid wood, finished in place flooring will range starting at about $7 and range up to the $30 per square foot, finished and installed. The higher end number will feature a faux finish that is labor intensive, with clad staircases and transitions to tile included. It could take 2 weeks to do a floor like that in your average house. Laminates in high traffic areas could look quite worn within 3-5 years. Dogs and high heels can be tough on them and you need to remember that refinishing these lacquer coated faux panels is not possible. There simply isn’t enough wood there to work with. Solid wood flooring depending on the species can last centuries. It gains character as it ages. Pine will show more wear–hard wood like ash or hickory will show less wear. So, your decision for flooring can last a few years…or a lifetime, with a similar cost. Our solid wood flooring is a full 7/8″ thick when you get it. Laminate flooring will vary between 1/4″ and 3/8″ generally. Consider levels when deciding on flooring. When you change the height of a floor, this will affect the stair risers, (height of the top and bottom step–as well, finishes may not match well. Laminates are notorious for not having parts readily available or enormously expensive and time consuming to source. Many engineered flooring does not get fastened to the floor–they lay on a mat and are glued to each other. This system does not work particularly well on stairs which means jury rigging your tread cladding. Depending on the species, solid wood will help deaden sound transfer from the upper floors to the lower. Laminate is light weight and will not deaden sound much. We recommend gluing our floors in place, which increases the mass to include the sub floor in one thick mass. This will help keep sound transfer down and actually add strength to the floor. We can fabricate stair treads, nosings and transitions if you need them–or sell your contractor the extra raw materials to do it from the same species.Since the finish goes on after installation, color matching is not an issue. Before installing laminate flooring you will have to achieve an even–smooth sub floor, otherwise the flooring will move and cause premature failure. When it comes to renovation work, this often means sanding the entire floor area with a large drum sander, belt sanders or palm sanders and the amount of work can be cumbersome and affect the overall budget. Working with our solid wood flooring, the odd inconsistency in level of flooring, up to about 3/8″ is fine– just glue the flooring in place and you won’t have any issues. When you sand the flooring after installation, the inconsistencies will not be noticeable. Laminates change their look and style with the weather–so what you buy today, may not be available 5 years from now. Buy enough for repairs and patches, and realize that if you have your new staircase finished to match your stylish new flooring, you may not be able to buy a match for the flooring later. Old school wide plank solid wood flooring gets finished in place after sanding in place. There are tens of thousands of specialists that do the finishing for you in North America–just google it. You choose the colour, texture, finish type and whether they accentuate flaws or knots or keep them to a minimum. The flooring specialist can supply you with finish samples prior to applying the finish. This is flooring like that in a homes 100 years ago–which has the disadvantage of taking a little longer to put down and finish, however, you will be able to refinish it a few times and enjoy the floor for up to 100 years. You need to look closely at the floor that is there now because normally it will have to be removed before putting down the new. Whether it will stay together when you nail the new floor in is only one of the factors to consider. Will the nails penetrate deep enough into the sub-floor to hold tight? Will the floor work it’s way loose over years to come and will the stair risers all be the same after the installation. I have only actually put a floor over an existing floor once, and that was a white cedar floor that was face nailed, tight and more like a sub-floor than regular flooring. As a rule, the existing floor gets stripped out. Once the floor is removed, you have to look for uneven patches. Often buildings are added on to, porches become part of the room, walls between additions get removed and you may have to use a sander to even things up before you put the new flooring down. You will choose a long run that is perpendicular to the sub floor direction and start by chalking a line. The first row of flooring needs to be put down perfectly straight. Any natural curve (crown) needs to be pulled straight. The tongue must be laid in the direction of the floor getting put down–so the tongue goes towards the outer wall. This first row can be nailed in place or put down with countersunk screws, you will be pulling the other boards against it, so it needs to be secure. RULE #1 for using Colling-Wood Flooring, “Always glue the flooring down”. Construction adhesive will keep the flooring in place in the coming decades. It also helps keep wide plank flat. Here we applied an exterior stain, (one that dries solid), because the basement is an open crawlspace which is damp from time to time. It will prevent the floor from cupping. RULE #2 for using Colling-Wood Flooring, “Trim 6-8″ off the ends of each board”. The ends of the boards will be slightly smaller and there may be planer snipe (it may be a little thinner), so, trim some off the ends and you will have a nice tight floor. You will notice when you receive your flooring that these boards are up to 16′ long and up to 11″ wide. Most producers only make flooring up to 5″ wide, and they trim the ends for you. You are buying direct from the mill–we cut it, we dry it, we plane and mill it to the profile. When you tell us the square footage we add some extra for removing the ends. I have never run short when Merv’s folks calculate what I need. You will need basic carpentry tools, but the specialty tools you will need are pneumatic or manual nailer. These shoot pins or staples normally. I like the pins better, but the staples work fine. It is personal preference. I use a 15 gauge nailer for the spots where you can’t use the flooring nailer–and quite often countersunk screws and tapered plugs in high traffic areas like thresholds and stair nosings. You will need a tool to pry the flooring. The guys above were using a chisel–however that was Beech–very hard wood. If you try that on pine it will crush. Always use a block to push pine or other soft woods. You will need a flush cut saw to trim casings, stair stringers or anything else that might be obstructing the floor. Cutting around these things just isn’t the right way to do it. Here is an example, we placed a piece of rough flooring against the stringer here, and cut it clear of where the new nosing will be placed. And the nosing slides right in. We also use the flush cut saw to cut off tapered plugs prior to sanding. Remember… glue the plugs! RULE #3 for using Colling-Wood Flooring, “NEVER putty before finishing!”. You need to resist the primal urge to apply putty to every crack and gap and nail hole in the flooring before finishing–but the truth is, cabinet makers and professional craftsmen will never ever do it. Residue of the putty prevents stain from getting into the grains where putty has been applied…and you will see an irregularity in the finish. Stain, Verathane….then putty. Use color matched wax based putty for best results! If you have any questions…feel free to write us at the email on this page! When you want to learn about flooring there is no better way than to remove a floor that lasted half a century. For a floor to stay down and last that long they must have done something right. –and this was the flooring that was only 1/2″ thick that was sold in the early seventies and installed in millions of floors in North America. This kind of floor could only be refinished a couple of times before needing to be stripped out and often only lasted a decade or two. We had opportunity to witness a job first hand near Barrie Ontario where the old hardwood was being removed after nearly 50 years of service. The first thing we noticed was that they had installed tar paper, like many flooring installers do, however, they also had a layer of building paper beneath the tarpaper. It wasn’t beneath the entire floor–just the area that remained tight and squeak free. It looked like part of the floor was done at a different time, because all they had beneath that portion was building paper. That whole section of the floor was loose and noisy under foot traffic. The second thing we noticed was that there was lots of damage due to a leaky roof, and a patio/foundation issue that has caused moisture to enter the floor system yearly during spring thaw. It was coming in through the dining room and also at the patio door, so these are things that need to be addressed before the new floor gets installed. Between the two areas of floor, there was also a dramatic difference in the number of nails used. The tight section used roughly 2x the number of fasteners as the one that went loose. Whether there is much actual difference in performance or not, remains debatable–but in this case, in the days of pneumatic fasteners it is a fairly easy thing to install a few extra nails to help the floor last longer. Here is the new floor acclimating to the moisture levels in it’s new home. This normally takes a couple of weeks to happen. This is random width white pine flooring from Colling-Wood Flooring. It is dried to 6% and will shrink and expand less because of that fact.